On the morning of September 12, 1814, five thousand British troops landed outside of Baltimore and marched on the city of Baltimore with a plan to capture the city. Major General Robert Ross, a veteran of the Napoleonic Wars who had burned the White House and the U.S. Capitol just a few weeks before, led the advance. However, within hours Ross was dead after being shot by an American – perhaps Daniel Wells and Henry G. McComas although their claim on the deed is now considered unlikely. Following the Battle of North Point, the British forces realized the strength of the defenses at Hampstead Hill, now located within Patterson Park, and returned to the site of their landing to head south towards New Orleans. In 1896, the federal government took over the British landing site and completed construction on a coastal artillery fortifications to defend Baltimore from naval attack in 1901. In 1900, Secretary of War Elihu Root named the site Fort Howard after John Eager Howard, a Baltimore native and Revolutonary War veteran who is buried alongside veterans of the War of 1812 at Old St. Paul's Cemetery. In 1902, five of the six coastal artillery batteries were named for men who witnessed the War of 1812 including Lt. Levi Clagget who died at Fort McHenry, Col. Davis Harris who commanded a regiment of artillery, Brig. Gen. John Stricker who commanded the 3rd brigade Maryland Militia, Judge Joseph H. Nicholson who served as Captain of Volunteer Artillery at Fort McHenry, and, of course, Francis Scott Key, the author of the Star Spangled Banner. A sixth battery was named for Dr. Jesse W. Lazear, a U.S. Army doctor who died in Cuba in 1900 while conducting research on yellow fever. Known as the "Bulldog at Baltimore's Gate," Fort Howard was manned by the 21st, 40th, 103rd, and 140th Companies of the Coast Artillery Corps but remained quiet throughout WWI and up until the fort shut down in 1926. 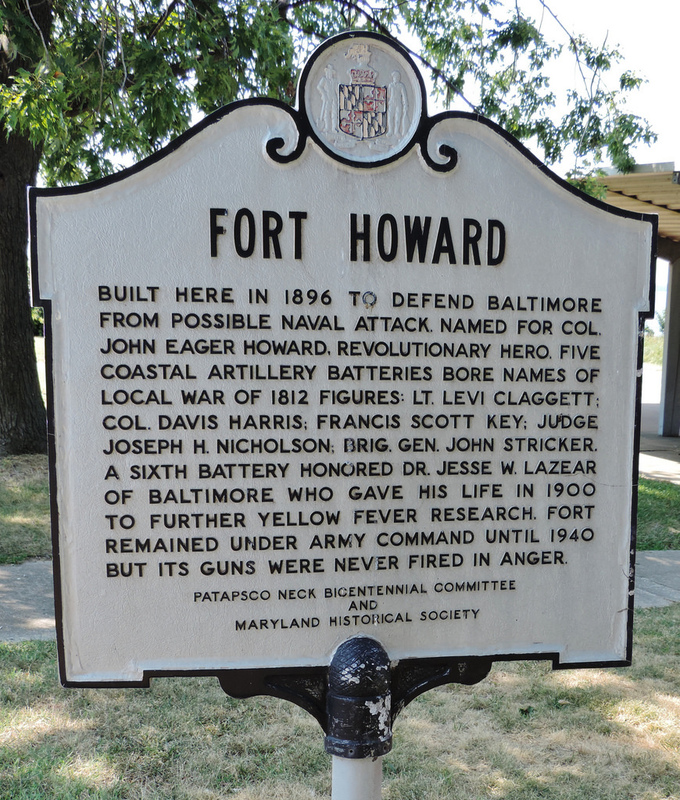 Fort Howard was transferred to the Veterans Administration which built a hospital on the grounds in 1943. Today the coastal batteries are incorporated into Fort Howard Park and, while covered in ivy and masked by bushes, endure as a reminder of the importance of the spot from the War of 1812 and on. Eli Pousson, “Fort Howard,” Explore Baltimore Heritage, accessed April 23, 2019, https://explore.baltimoreheritage.org/items/show/191. Published on Feb 12, 2013. Last updated on Dec 29, 2018.